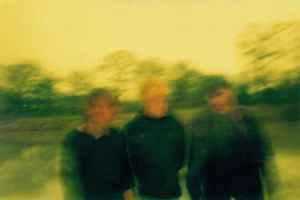 From 1988 to 1996, Maeror Tri were a German trio that used only electric guitars and tons of processing devices to create their floating and static droning soundscapes. The group is now disbanded. Knappe and Gitschel formed Troum, Siehl is currently working as Tausendschoen. Unlike many of their peers from tape underground (Bestattungsinstitut, Hithlahabuth and others) Maeror Tri became quite well-known to the general public and worked together for many years. One of the reasons is the fact that they were touring constantly, the other is that they developed a new sound, something that wasn't really popularized and produced before - form of ambient which is usually associated with electronic instruments, but produced without any electronics at all. There were a lot of instruments involved - including guitars and flutes, with most of them being treated to the point where it was hard to recognize the original source. During their existence, material produced by the band was released in extremely small quantities. However, after their break-up, a number of reissues and re-releases of old material appeared on labels like Waystyx, Blade Records as well as on resurrected German label ZNS Tapes in mp3 format. Overall, Maeror Tri deserved their place in history as one of the most unique acts. With more reissues on the way, there's still a lot to explore about this unusual German band.